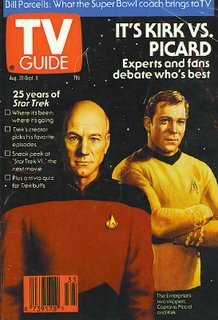 John Kenneth Muir's Reflections on Cult Movies and Classic TV: RETRO TOY FLASHBACK 23: Sci-FI TV Guides! RETRO TOY FLASHBACK 23: Sci-FI TV Guides! 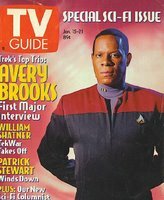 In addition to all my other collecting quirks, I happen to collect issues of TV Guide featuring science fiction and horror TV shows. Don't ask me why, I just do. I have a drawer full of these things in my office, so I figured it might be fun this week to focus on my "collectible" genre covers, especially since the magazine recently altered its format to become more glitzy. I suppose that makes my collection even more...collectible? When I was a teenager, I was always thrilled to come home from school every Thursday afternoon to get the TV Guide for the following week. 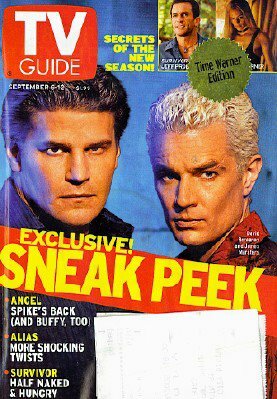 My favorite among all issues was the annual "FALL PREVIEW" edition, revealing which shows were returning, and which ones...weren't. 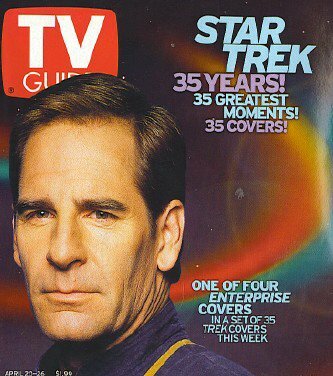 It was here, in this FALL PREVIEW edition, for instance, that I first learned that Buck Rogers in the 25th Century would return for a second season...though drastically altered, and featuring a guy named "Hawk." 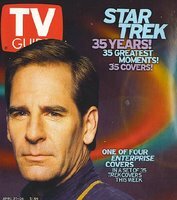 And I'll never forget the day in 1985 when I cracked open my TV Guide to see if NBC would air a new episode of V: The Series on Friday night, and I read the foreboding words "last episode of series." Not "last episode of season." Nope, "last episode of series" simply meant that the show was axed. And terribly, this happened that same week that the last episode of Otherworld aired. Don't remember Otherworld? Okay, well I think it only ran for six weeks, but it was a sci-fi series about a "normal" suburban family thrown into an alternate dimension after a visit to a pyramid in Egypt. I remember, Mark Lenard guest-starred in an episode as some kind of military scholar. Pretty soon though, the magazine got wise to the fact that fans were enjoying it and began issuing "collectible" alternate covers in the 1990s. Clever publishers. Very clever. Now I had to buy four versions of the same issue. So now, like I said, I have a drawer full of TV Guides with science fiction and horror imagery emblazoned on their covers. My collection basically spans the 1990s to present, from the heyday of Star Trek: The Next Generation and SeaQuest DSV to Buffy/Angel. In closing, I remember a line from the grandpa (played by Barnard Hughes - Mr. Merlin himself) in The Lost Boys (1987). His grandson, Corey Haim, looks through a TV Guide excitedly, but then realizes his Grandpa doesn't actually own a TV. "If you get TV Guide," the old curmudgeon states wisely, "you don't need a TV..."
TV REVIEW: Medium: "Being Mrs. O'Leary's Cow"
TV REVIEW: Medium: "I Married a Mind Reader"
TUESDAY CATNAP # 21: Happy Holidays! Midwest Book Review likes Singing a New Tune! TV BLOGGING: Invasion: "Origin of Species"
TV REVIEW: Lost: "What Kate Did"